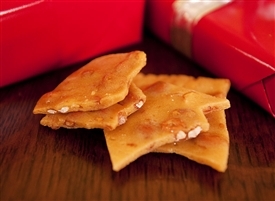 Our delightfully crunchy and peanutty hand-pulled Peanut Brittle! An old-fashioned favorite, our is just like you remember it! We've made the same way for over 80 years here in our Candy Kitchen. Ours is carefully packed in a 12-ounce box, sealed for freshness, and gift wrapped in our signature red paper. Enjoy! Our Price: $6.99 per lb.